Written by Costa Panayi for the ZX Spectrum. Amstrad CPC conversion by David Aubrey Jones for Discovery Software, and published by Vortex in 1985. Commodore 64 conversion by Simon Nicol, with music by David Dunn; published by Ocean in 1985. Well over three years into the blog's life, I think it's about time I made a comparison of a game by the great Costa Panayi, the man responsible for such Spectrum classics as Highway Encounter, Cyclone and Deflektor. 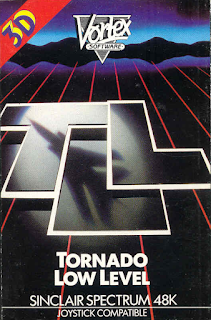 TLL, the official title abbreviated from the alternative full title "Tornado Low Level", was my first step into the world of games by Costa Panayi. At the time, I was only about 4 years old, so I didn't pay much attention to who made the games I was playing, nor did I realize or care about what a legendary man he was to become, but I did notice, how extraordinarily different TLL was from other games around at the time. Naturally, I didn't understand how to play it, but I recall it being one of my brother's favourites, so this one goes out to him. Currently, at the World of Spectrum database, TLL has a score of 8.16 from 121 votes, while the most reliable competing score is 6.4 from 12 votes at Lemon64. The two ratings at my most frequented Amstrad CPC websites are 5 out of 10 at CPC Game Reviews and 12 out of 20 at CPC-Power. So there definitely seems to be a clear starting point for this one. TLL is a game that should be easy to describe in a few words, but fails at it spectacularly. At the very bottom of it, it's a multi-directionally scrolling shoot'em-up, in which you need to seek and destroy enemy targets shown on map. In true Costa Panayi tradition, it's not nearly as simple as you would expect. You fly a Tornado jet fighter around a three-dimensionally built scenery full of different hazards - hitting the ground or structures will cost you a life, for instance. You also need to keep an eye on your fuel gauge and time limit, but unlike most shooting games of its time, TLL singularly focuses on the actual gameplay mechanics, such as adjusting your wings and avoiding natural hazards. If someone would be in need of a quick description and pointers to other games of similar kind, I would have to say it's a mixture between Blue Max and Raid On Bungeling Bay, but TLL is definitely its own sort of a thing. For any shooter fan, particularly those of you in need of some variety, TLL should prove worth your while. Even if you're not into dabbling too much with controls, TLL should suit you fine, because while it has some more depth to it than normal shooters, it's nothing you shouldn't be able to handle with a couple of minutes of getting accustomed to it. Loading screens, left to right: ZX Spectrum, Amstrad CPC, Commodore 64. One of the best things about TLL is, that it explains itself rather thoroughly, which is something not often seen in games of that age. So, I'll try to make it clear and as short as possible. The start menu allows you to change your control method, which can be either a joystick or the pre-set keyboard controls. The C64 version additionally allows you to change the difficulty level from four possible choices: Novice, Co-Pilot, Instructor and Ace; however, the difficulty levels are available on all versions, they're just not choosable. The rather thorough instructions can be seen from the menu, but the AMSTRAD version has left only the HUD explanations intact - after all, the rest of the information is featured on the cassette cover leaflet. For the sake of making things easier for all you comparing enthusiasts, who want to enjoy all versions of TLL with as little expense of energy to yourselves, here are the keyboard controls for all three versions. I think it's easier to play the game on a keyboard rather than a joystick, because you still need to use the map key from the keyboard even while playing on a joystick. Then again, after a while you get to know the map and you won't be needing the map key, so it's mostly a matter of preference. To start your run successfully, you first need to let the Tornado get filled up with kerosene, after which you press the designated fire button to take off. Climb when you hear the Tornado engine change the sound, and you're ready to go find some targets to bomb. The first in-game differences can already be found here: in the AMSTRAD version, climbing and diving are handled in the opposite manner to the other two versions; and also, the C64 version has an awkwardly flowing climbing and diving method, where there should be no flowing at all. The only way to stop the Tornado from climbing or diving to any extreme altitude is to turn the Tornado when you want it to stop climbing or diving. Only the SPECTRUM version handles properly - pulling back will make you climb, forwards will dive, and you can change your altitude with precision and no fear of automatical flowing in either direction. The idea is to fly low when approaching a target, and in the SPECTRUM and C64 versions, the Tornado will drop a bomb automatically when passing over the target at an appropriately low altitude. In the AMSTRAD version, you drop bombs by pressing the fire button, but you still need to approach the target from a very low altitude. Also, because you need to manually drop the bombs, you are given a finite amount of bombs to drop, as shown in the map screen. If you want to check the map screen during play, you need to land the Tornado first in the SPECTRUM and C64 versions, but you can view the map in mid-flight in the AMSTRAD version. This has been made so, because the action happens in full screen mode, so you won't be seeing any radars and other stuff, like you do on C64 and SPECTRUM. There is just one other thing I need to mention: the speed of the game. As the action screen is comparatively small on the SPECTRUM and C64 versions, the screen scrolls on a sedate enough pace. When you put the wings back and go full throttle, the speed doesn't alter all that much, but instead you have a better maneouverability. Because all of the AMSTRAD screen has been utilised for displaying the action, the top speed was also made a lot higher, which actually is remarkably fast, and surprisingly smooth. 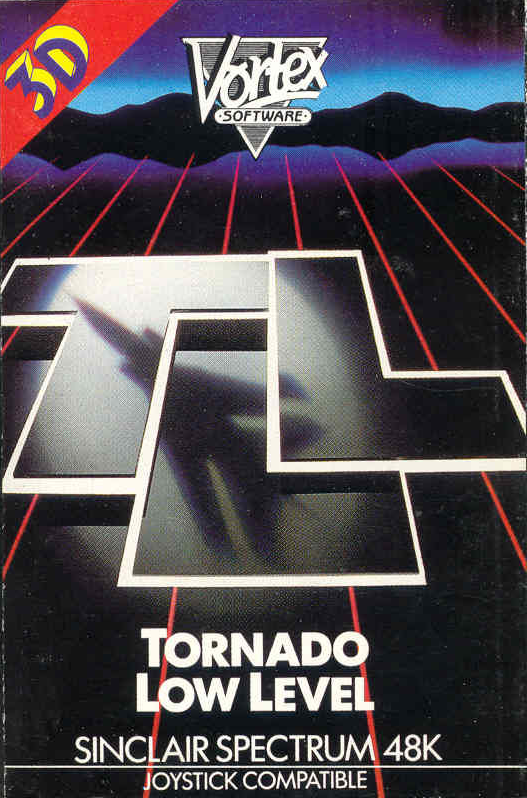 Unfortunately, the speed is so fast, you will have more trouble keeping your Tornado away from surprise obstacles, so only more seasoned TLL'ers will have the confidence to fly full speed on Amstrad. Vortex Software, and Costa Panayi in particular, was probably best known for how their games looked. TLL is the second game (from a series of three) by Panayi, which shows the playarea from a particular kind of top-down view, allowing altitude differences to be shown relatively clearly in the graphics. Before we get into the greatness of it all, let's start from the title screen. Title menus, left to right: ZX Spectrum, Commodore 64, Amstrad CPC. All three versions have a title menu built of two panels on apparently different levels. Contrary to the SPECTRUM and AMSTRAD versions, the C64 version doesn't make any use of the panel below the one with the game title logo and all the menu items, but then the two panels are shaped and situated very differently to the other two versions. Also notable is, that the AMSTRAD version only features the proper TLL game logo in the loading screen you saw earlier above, and the Vortex logo is missing from the C64 version - it bears a basic Ocean copyright instead. Another interesting redesign choice in the AMSTRAD version is the two panels' colouring, or more precisely the lack of. Only the outlines of the panels have been coloured as they should, but the lack of fully coloured panels allows the text to be more colourful with less chance of looking messy. Instructions. Top row: ZX Spectrum. Bottom left: Commodore 64 (scroller). Bottom right: Amstrad CPC. The information bits have been dealt with in very different manners in all three versions. 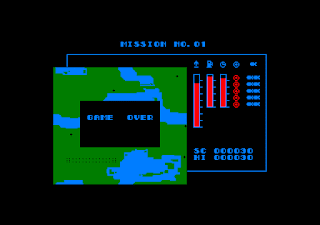 For the original SPECTRUM version, Panayi included three full screens of instructions, which feature a detailed mission briefing, description of the status report items on the blue panel, and all the controls. All the necessary information is also included on the C64 version, but it all is shown in the main menu screen - the whole litany of instructions is scrolled at the bottom of the screen, and it takes longer to read from there than it would be by picking up the cover leaflet and scanning through that. The AMSTRAD version only features the status report item descriptions, and that's it, but at least it's a separate screen that shows things properly. 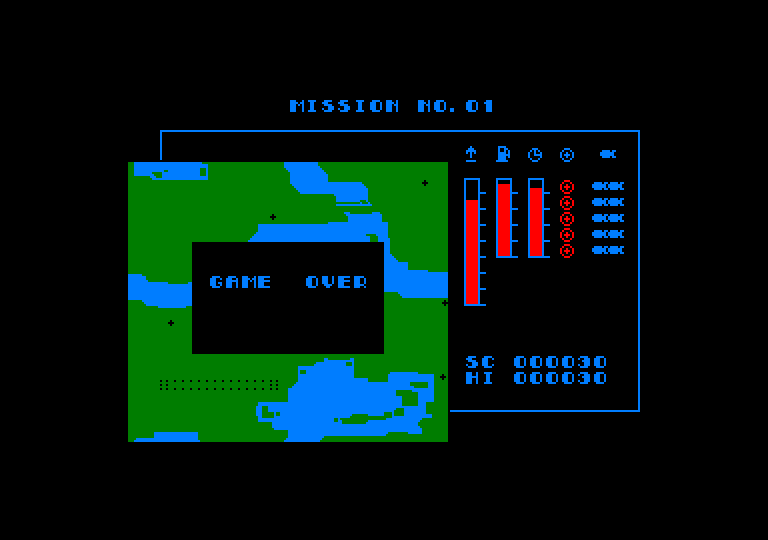 Mission briefing (map screen), left to right: ZX Spectrum, Amstrad CPC, Commodore 64. Before you are allowed to take off, a map of the area is shown, including the targets for the current mission as flashing spots. The spots are shown as very small dots on both AMSTRAD and C64 versions, but the SPECTRUM version surrounds the immediate area of each target with a squared area the exact size of a character block, which of course is flashing in its entirety. Can't imagine why, can you? Well, in this case, the attribute clash is at least helpful for finding where the otherwise microscopic dots are on the map, since there are other very small dots in the map that are nothing more than small islands. Interestingly, the C64 map doesn't look exactly like it should. Naturally, the reason for this is, that the map isn't exactly the same. In-game shots of the starting runway, left to right: ZX Spectrum, Commodore 64, Amstrad CPC. Now we get to the interesting part. The view shown in the original SPECTRUM version is the smallest of the three, and it has the least amount of details. The AMSTRAD version shows us a view almost twice the width of that in the Spectrum version, and it also has the most detailed graphics overall, but then it doesn't have the radar and other data on the same screen, since it can be shown at any given time, unlike in the other two versions. The C64 version falls neatly between the other two, having a bit more action screen width than the original, and still featuring the radar screen and the other info bits below the action. That said, the radar in the C64 version is probably the most useless radar I have ever seen, since it doesn't show the targets or anything else of much worth. Also, the amount of detail is as bad as on SPECTRUM, but the focus for details is switched to other things. 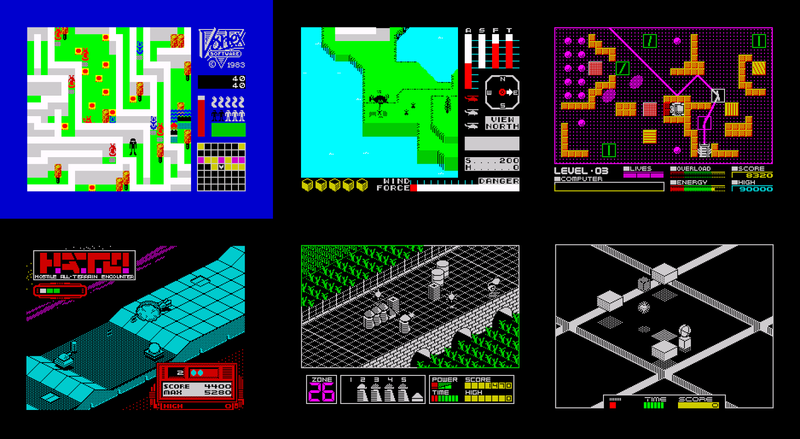 In-game screenshots of other structures and terrain variations, top to bottom: Commodore 64, ZX Spectrum, Amstrad CPC. In addition to your Tornado, land, trees, roads and buildings (as shown earlier), the in-game graphics of TLL consist of water, bridges, targets, some sort of spiky things sticking out from the ground (flagpoles, maybe?) and power lines. Because some of these things rarely are shown within the same screen as some of the others, I've had to take a few screenshots and combine them into one big set. Although I can't say for sure, since I haven't found any interviews or documentation (yet) that would bring some light to this matter, but it very much looks like the map was drawn with some sort of a character-based editor, since the amount of different kinds of ground and water elements and shapes would point towards it. There are no properly rounded corners or naturally abstract shorelines or anything like that, only 45- and 90-degree angles. But it's early 3D, so at the time, it was more than you would have expected. 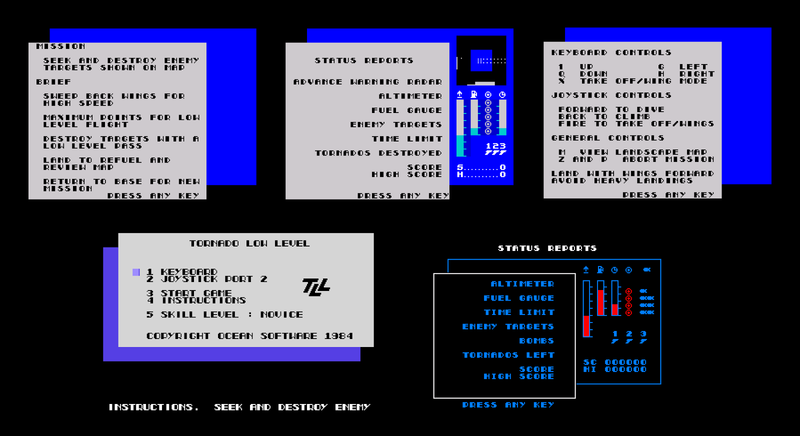 Screenshots of Tornado's crashing animation, left to right: ZX Spectrum, Commodore 64, Amstrad CPC. The only proper bit of animation comes in the form of your crashing into things. In the SPECTRUM and C64 versions, the animation is monochrome, but curiously, the C64 animation is more of a small puff than a real explosion. The SPECTRUM version also changes the border colour to red when a crash occurs. While the AMSTRAD version doesn't change the border colour, it uses plenty of colour and even more animation frames in the crash animation, so it's a fair spectacle compared to the other two. Clearly, a proper Game Over screen is something Costa Panayi wasn't too concerned about when putting the finishing touches into this game. Not that such a screen is actually needed, but a lack of ceremony for such an occasion somehow makes the game's untimely end a more expected and mundane happening. A very simple Game Over screen was added for the AMSTRAD conversion, which is a nice addition, but as I said, hardly necessary. While TLL cannot be called a particularly good-looking game, it served as part of transition in 3D graphics - third person 3D graphics in particular. The SPECTRUM version set the basic structure and was a good stepping stone into even better 3D graphics, and as such, was of the highest standard of its time. The C64 version, at least graphically, is not much more than an attempt at copying the original as closely as possible, while trying to use the C64 screen size to the conversion's advantage. Not very successfully, I'm sorry to say. The AMSTRAD version's graphics are the most pleasing, having the biggest area displayed, as well as the biggest amount of details and colours, but it also does it all in its own particular way with great success. It is arguable, whether the original SPECTRUM form of having the action screen and the info panel in the same screen is better than the opposing AMSTRAD method, but I for one am more comfortable with the full-size action screen, as the map in its relative smallness is easily memorizable. Having been primarily developed as a vehicle for Costa's new 3D engine, I would imagine most of the game's memory requirements was taken by the way the 3D map works, so there might not have been much space left for anything as frivolous as a theme tune or better quality sound effects. Of course, I might well be wrong, and Panayi just didn't bother with such things, but I haven't found any information regarding the development of this game, so I can only guess. As it is, the original TLL features only a few sound effects: some chirpy engine noise from your Tornado (with varying pitches); two different hit acknowledgment noises - your crash, which is a long choppy blast, and hitting a target, which is a very quick splat-like noise; a high-pitched "pip" noise for filling up your tank and a quick high-pitched "brrrrp" for filling up the timer at the beginning of the game. The AMSTRAD version ups the ante with some better-crafted engine noises and three different explosion noises, all of which are more realistic and fitting for the game than anything anyone was able to produce on the 48k SPECTRUM at the time. Aside from that, there are only a couple of different beeps used for the map screen and time running out. Uniquely, the C64 version has a theme tune, which sounds like something from the second World War, originally meant to be played by a large military band. It's a nice change from the form, but I'm not entirely certain it sets the correct tone for the game. There's nothing particularly wrong about the tune - it's well programmed, if sparingly instrumented, but it's a bit too happy and gives a sort of positive war-nostalgia vibe that I don't really agree on with whoever chose this tune for the C64 conversion. Still, a well-constructed tune is something extra compared to having no music at all. After such a strangely positive first impression, it's strange, how messy the sound effects feel. Most of the in-game time, your ears are filled with loud wind blowing sound which alters pitch constantly, which doesn't work very well in the context, since you'd rather hear the engine noise. Aside from that, you get the basic explosion sounds, which work well enough, and a whole lot of weird blirpy sounds that belong to some weird space shooter from 1985, which are played during the map screen - each time you show the map screen. Just because sounds are nice to have in a game, doesn't mean one should splatter them all around the game in an unfitting manner, so aside from the theme tune, I wouldn't recommend the C64 version for anyone who wants a good TLL experience. The SPECTRUM version isn't much better, but the scarce sound effects that it has, are made with more thought to the context, but they are more than a bit irritating in the long run in their own way. The AMSTRAD version comes forth once more as the victor. TLL is one of those games that has "Spectrum" written all over it. It just oozes that certain something that games developed originally for the Spectrum characteristically have, although I cannot put it in few enough words, what I mean by that. I guess it has something to do with charisma and stylistics more natural to appear on a certain kind of machine architecture, but even the lesser-quality elements of the game have the soul (for the lack of a better word) enough to make the original game as classic as it is. So, the mathematical overall results don't really tell the whole story, as we can once again see. If you want to focus on one specific area of the game, on which you must make your choice, let that be gameplay, because that's what TLL is all about, and that is how Costa Panayi originally developed it. The Amstrad conversion is a bravely differing alternative, which does its thing well enough, but makes the gameplay too much of a hassle. The C64 version's only saving grace is - not very surprisingly - the music, which really isn't very necessary. As I've mentioned previously, Costa Panayi's back catalogue features plenty of other classics worth your time, but TLL is a good place to start. That's it for today, and indeed, for this month. Thanks for reading again, hope you enjoyed it! See you next time with something worth keeping up the blog's name!